NES Super Mario Bros. (JPN PRG0) "warpless" in 18:44.48 by adelikat, klmz & andrewg. This movie is a full warpless run-through. It is about a 2.5 second improvement over the previous movie by Happy Lee. 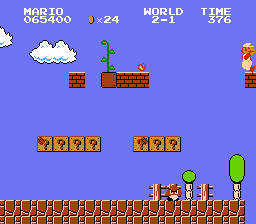 Most of the improvement comes from a new "vine glitch" that was used in 2-1, 3-1, and 6-2.